Yinglan of “A Simple Life” nominated me for a 3 Day 3 Quote challenge. I believe this is my second or third nominaton for the quote challenge. To spice things up, I thought of making it more exciting… By getting quotes posted in the social sites but were actually never been really said by the person associated with it. 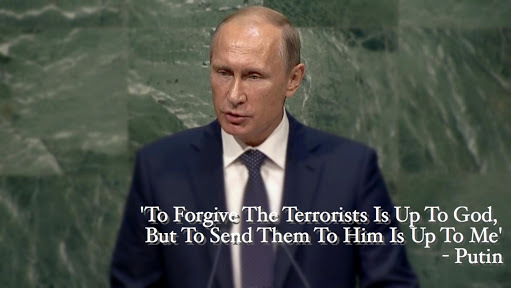 Putin’s “quote” after the Paris attack went viral. A lot jumped into the bandwagon and started sharing Putin’s quote in Facebook and twitter. But the fact is… He never said it! Did you know that in the movie “Man on Fire” (2004), this phrase was said by Denzel Washington’s character? I LOVE this idea! There is so much random junk floating around on social media that ignorant people continue to believe and spread without giving it a critical thought. It makes me so angry that people do this! Same here.. I usually check things with Snopes and inform my friends. But then again, there are some people still sharing hoaxes even if you told them they’re not true.